Follow the Seine upstream and you’ll arrive at this cute little town called Giverny, home to le maison et jarin de Monet (Monet’s house & garden). This is where he painted his famous waterlily series. Its a perfect garden for impressionism, the light and colors almost seem to meld together. Of course, autumn is when everything in the garden begins to die. For some people, this is rather depressing, as it marks the coming of winter where everything is cold and dead. But I kind of like this idea. I like the fact that not everything is sustainable, that life needs to rest so it can live again. Death cannot exist without life, and life cannot exist without death. Plus, I like the pretty colors. My travel buddy and friend Amy on Monet’s famous curved bridge. We couldn’t take photos inside the house, but there were some pretty great impressionist paintings a l’interior. Last Saturday night was Nuit Blanche in Paris. Unlike New York, Paris is a city that usually gets at least some sleep. However on Nuit Blanche the city stays awake, modern art exhibitions are installed throughout the city, open from 7pm to 6am. Creperies also stay open, as a nutella filled 2am art break definitely hits the spot. I’ve been dreaming of nutella crepes ever since. Many exhibitions are are installed within the many (many) cathedrals around this ville. This exhibition was in the Saint Severin eglise right behind Shakespeare & Co in the 5eme. 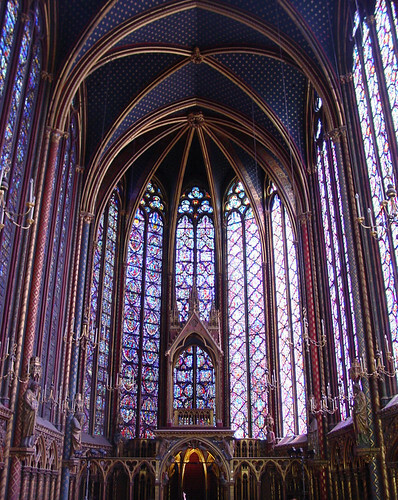 Stereos were installed around the eglise, each emitting a different choir voice. Look at the first video for the scene of the place, the second gives you a better idea of sound. This exhibition was at the Eglise Orthodoxe, just north of the Pantheon. The exhibition itself was some sort of suspended object intended to appear as clouds. Pillows were placed underneath the instillation so the audience could sit and look up at the cloud(s), which is exactly what I wanted to do after hours of walking around. The Jardin of Luxemborg also had a neat exhibit, although I didn’t brave the Obama inauguration style crowds to get inside the gardens. Fortunately, the Eiffel Tower’s Mistress, as she’s called, could be seen from anywhere in the proximity. Think huge disco ball in the sky (side note: all of the clubs here are called discotheques). Here’s a daytime photo, the day before the Nuit Blanche. Sometimes I don’t understand modern art. I know that this exhibition at the mosque has something to do with earth and water, but I don’t get it. This past Monday was Yom Kippur, and I fasted for the first time in a few years. I did not fast to absolve the sins of the past year, but to practice discipline and to experiment with sustenance. I believe that the abjuration of food for a day is a reminder for how good it is to have food. Without sheds perspective within. The idea of fasting is interesting, especially because some form of asceticism is evident throughout religions. Christians absolve for lent and Jews and Muslims fast on Yom Kippur and Ramadan, respectively. During the fast, I turned off all of my electronics. I didn’t check my email or listen to music. I spent the day walking the streets of Paris and reading in various gardens. And it was good. I walked through the Mosque by my house, then along the Seine to Sainte Chapelle. Wander weak from walking without food, I spent 2 hours sitting in the cathedral, admiring the Gothic arches and incredible stained glass. I walked through the Jardin of Tuileries then up the Champs Elysées. When I couldn’t stand the traffic anymore, I wander walked along the side streets towards the Arc de Triumph. I was hyper sensitive to smells and sensations during my fast. I’m not sure what was more disturbing, the pungent stench of urine underneath the bridges or the sweet smells emanating from creperies spotted around the city. During a fast, the hunger pains come and go, but thirst remains. Its difficult to go the entire day without water. It wasn’t really that difficult to go without food for a day. Sure, it would be nice to eat, and it might lift the cloud of disorientation, but I wasn’t preoccupied by it. In fact, there was a point in the afternoon where I felt entirely past hunger. The purpose of fasting is for that moment, the moment of realization that while we need the material for sustenance, that’s all it is, sustenance. We’re so preoccupied with counting calories and worrying about the difference between saturated vs. monosaturated fast (the former is in butter & red meat, the latter in olive oil & avocados) that the purpose of food is forgotten. The purpose of food, and of everything else, is to enjoy. Since the fast, I’ve been appreciating food. And it is good.